An in-depth study recently published in the Journal of the American Medical Association (AMA) found that hospitals profit when patients suffer from complications or errors after surgery. The reason for this is quite simple: complications and errors mean more tests, procedures and lengthier hospital stays, all of which can be billed to patients’ insurance or Medicare. The JAMA study examined approximately 35,000 surgical cases and discovered that those with private insurance who experienced surgical errors or complications increased hospital profit margins by 330%. And when it came to Medicare patients experiencing surgical problems or mistakes, hospitals increased their profits by 190%. Approximately 1 of every 6 deaths in the U.S. is caused by preventable hospital mistakes. Ten to twenty times that many patients will survive the mistakes but have severe injuries. In total, well over 400,000 patients are killed in hospitals annually by preventable errors, and millions of patients suffer serious harm from these mistakes. When physicians become of aware of mistakes made by other physicians, these errors are seldom reported or even brought to light. In fact, one study found that 86% of medical errors that occurred were never reported. Multiple studies have found that when hospitals identify preventable errors that are occurring at their institutions, they seldom implement new policies to keep the errors from recurring. When mistakes made by physicians actually are reported (i.e., the physicians’ hospital/clinical privileges were restricted or revoked), most state medical boards do not take any actions against these physicians. This means that these doctors are free to practice medicine anywhere in the state because their medical licenses remain intact. When these studies circulated through the media, people were left wondering why hospitals are becoming less safe. One would think that with so much money being spent on research to detect preventable hospital errors and to uncover policies (or lack thereof) that harm patients, something would be actually be done to prevent the needless harm and death of hundreds of thousands of patients. But implementing new policies throughout a hospital is costly. And when hospitals actually profit from mistakes and errors, one might wonder what the incentive for implementing policies to reduce preventable errors would be. Certainly, the incentive should be less patient injury and death. The sad fact is that hospitals are aware of the troubling research and most have done absolutely nothing to change policies and prevent deadly errors. This research and inaction on behalf of hospitals nationwide raises many questions. Should the federal government use their power to force hospitals into implementing policies to reduce errors? This would only work for Medicare patients. Pushing hospitals to improve the level of care for privately insured patients would be much more difficult. Perhaps tough legislation could affect change in hospital policies and reduce preventable errors. But the road to this type of legislation would certainly be paved by opposition from the well-financed pro-hospital lobbyists. Still, this type of legislation is possible if the troubling research about the medical field is kept in the media and patient advocacy groups join forces to advocate for life-saving hospital legislation. Record, review, and report mistreatment or neglect. Write down the names of caregivers. Trust your instincts because if something feels wrong, it probably is. It is very important for the patient to play an active role in her treatment. If the patient is not fully awake and aware of her surroundings, it is a good idea to have someone sitting next to her as often as possible. When choosing a hospital, make sure the facility will allow a patient sitter to be present at all times. Patient sitters can help make sure that medical personnel wash their hands, don’t pull on items that can pull out lines that are in or on the patient’s body, and thoroughly read the chart of the patient. Lack of hand-washing and failure to read a patient’s chart (especially after a shift change) are well documented causes of preventable harm to a patient. Patients must remember that they are in charge. They have a right to read their charts and medical records whenever they want, and people given permission by the patient also may read the records. If a patient wants a patient sitter, she has the right to have one. Some hospitals may make this difficult, especially during non-visiting hours, which is why it is important to discuss this with the hospital prior to admission. In addition, patients should feel free to ask as many questions as they want. For example, it is important to ask the treating physician or staff member performing a procedure how many times she has performed the particular procedure, test, or surgery. When a mother is in the hospital for labor and delivery, a very important question to ask is how competent the staff is at interpreting fetal heart rate tracings. It is crucial to make sure that staff is present to review the tracings, and that the staff members, especially the primary obstetrician, have experience and skill in interpreting the tracings. Indeed, a 2013 study from Johns Hopkins found that 80,000 deaths AND 80,000 severe injuries each year are caused by wrong, missed or delayed diagnoses. Even if a physician misses a diagnosis that can affect the well-being of an unborn baby, the baby’s distress will be noted on the fetal heart rate monitor, in most cases. The key is to have a staff member skilled enough to detect even the early, subtle changes that indicate that distress in the baby is imminent. Research shows that a lack of skill in fetal heart tracing interpretation and a breakdown in communication among the medical team are major causes of preventable injury to the baby during labor and delivery. Close monitoring of a baby’s heart rate is always important during or near the time of birth. This is because the fetal heart rate is often the only indication of how well the baby is doing. If a baby starts to suffer from a lack of oxygen to her brain while in the womb, the fetal heart rate monitor will indicate this. There are many conditions that can occur during labor and delivery that can cause a baby to be oxygen deprived and in distress. Thus, it is also crucial to make sure the labor and delivery unit and physician have the ability to perform an emergency C-section if needed. Of course, it is the duty of the physician to get informed consent from the mother for any procedure performed. This means that the physician must explain the risks, benefits and alternatives of all procedures and potential delivery methods. But when a baby is in distress, a C-section is often the best (and sometimes only) way to quickly deliver a baby to prevent brain damage when she is being deprived of oxygen in the womb. Certain conditions, such as cephalopelvic disproportion (CPD) and total placenta previa, require a C-section delivery. CPD and macrosomia (large baby). CPD occurs when the baby is too large for the size of the mother’s birth canal/pelvis. When labor and delivery are not properly managed, a baby can get brain bleeds or suffer from a lack of oxygen in her brain for other reasons. When a baby goes without sufficient oxygen for too long, permanent brain injury can occur. Babies can end up with cerebral palsy, hypoxic ischemic enecephalopathy (HIE), periventricular leukomalacia (PVL), intellectual and developmental disabilities, seizure disorders, and hydrocephalus. Babies can also become brain damaged if an infection in the mother is not properly managed and it travels to the baby’s brain after birth. Permanent brain damage in a baby can also occur if a baby’s blood sugar or bilirubin levels are not properly monitored and treated when abnormal. Reiter & Walsh ABC Law Centers is a national birth injury law firm that has been helping children for over two decades. Cerebral palsy lawyer Jesse Reiter, the president of the firm, has been focusing solely on birth injury cases for 25 years. He is currently recognized as one of the best medical malpractice lawyers in America by U.S. News and World Report 2014, which also recognized ABC Law Centers as one of the best medical malpractice law firms in the nation. 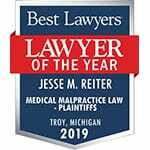 The lawyers at ABC Law Centers have won numerous awards for their advocacy of children and are members of the Birth Trauma Litigation Group (BTLG) and the Michigan Association for Justice (MAJ). If your child was diagnosed with a permanent disability, such as HIE or cerebral palsy, the award winning lawyers at ABC Law Centers can help. We have helped children throughout the country obtain compensation for lifelong treatment, therapy and a secure future, and we give personal attention to each child and family we represent. 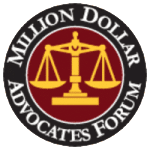 Our nationally recognized firm has numerous multi-million dollar verdicts and settlements that attest to our success and no fees are ever paid to our firm until we win your case. Email or call Reiter & Walsh ABC Law Centers at 888-419-2229 for a free case evaluation. 1. Eappen S, Lane BH, Rosenberg B, et al. Relationship Between Occurrence of Surgical Complications and Hospital Finances. JAMA. 2013;309(15):1599-1606. 2. James, John T. “A new, evidence-based estimate of patient harms associated with hospital care.” J Patient Saf 9.3 (2013): 122-128.3. Gallagher, Thomas H., et al. “Talking with Patients about Other Clinicians’ Errors.” New England Journal of Medicine 369.18 (2013): 1752-1757.4. Levinson, Daniel R., and Inspector General. “Adverse events in hospitals: national incidence among Medicare beneficiaries.” Department of Health & Human Services (2010).5. Levine, Alan S., Robert Eugene Oshel, and Sidney M. Wolfe. State medical boards fail to discipline doctors with hospital actions against them. Washington DC: Public Citizen, 2011.6. Woolf, Steven H., et al. “A string of mistakes: the importance of cascade analysis in describing, counting, and preventing medical errors.” The Annals of Family Medicine 2.4 (2004): 317-326.